When most people think of Scotland they think of kilts, castles, and Nessie. One thing you should make sure to do when in Scotland is to visit Loch Ness. Luckily for you, there are some great tours right out of Edinburgh up to the Highlands and Loch Ness. 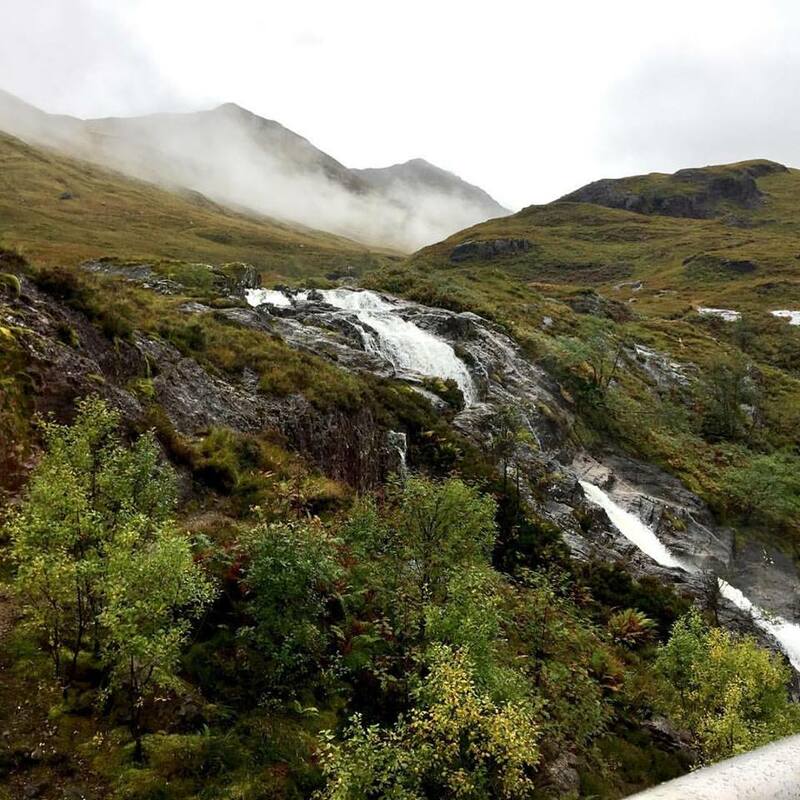 The tour Loch Ness, Glencoe, and the Highlands is truly an all-day affair packed with amazing scenery, history and maybe even a mythical beast. The journey starts off at Rabbie’s tour offices located in Waterloo Square. The tour begins at 8 am and the ay I went was raining so I hailed a taxi with the Gett App and it arrived within minutes to the door of Casa Hamilton. A short taxi ride for under 7 pounds got me to Rabbie’s in time to grab a quick bite in their cafe and an extra water to have in my bag for the day. After a quick check-in process, we were ushered up the block to the awaiting vans. But these were no ordinary vans. 16 person Mercedes Benz vans to be exact. We all settled in and got to know our driver and guide Dougie. He plays the part well in his kilt and tartan driving cap. Dougie got to know everyone on the trip rather early, probing to find out what interested us in order to tailor the tour to our desires. One fellow passenger was a geology teacher, so our tour delved heavily into the geological history of the highlands and the lochs. We first stopped in a charming little town of Callander. This was a great first stop. picturesque main street and some AMAZING PIES!. I would suggest Mhor Bread. Thier Bridie was the perfect mid-morning snack. Pipping hot and full of flavor packed into a delicate flaky crust. After a quick walk up and back on the main street, we were off again towards Glencoe. Along the way, we had a quick stop along the route for some pictures. Dougie was always good about giving us enough time to take some great pictures while keeping us on track for time. We continued further to Glencoe, learning about the rock formations and the glacial past of the area as well as Scottish clan history and important battles, betrayals, and ballyhoo. Upon reaching Fort Willliam we had a quick stop for some pictures, then we proceeded along passing the daunting Ben Nevis, Britain’s highest mountain. As there was some light rain and cloud cover we were not able to see the top of the mountain, but the size and scale were evident from what was visible. When arriving in Fort Augustus, Dougie made sure to let us know the best place for a sit-down lunch, takeaway and all the details for the Loch Ness cruise. Being that I had booked a ticket for the cruise, I wandered into The Moorings and grabbed some takeaway kebab before making my way over the canal to ready to board the cruise. While we did get some rain while on the cruise, it made the stories of Nessie seem all the more plausible. It was foggy, with a slight rain and the water is so dark, you can understand people’s claims over the years about seeing a great beast. The crew does a great job with a presentation mid-cruise. They have an active sonar to show the just how massive Loch Ness really is. They were delighted to take any questions and see themselves as stewards of the highlands as well as the Loch. About an hour and a half after arriving at Fort Augustus, we were boarding the van again to continue our journey. This leg would take us east and then south back towards Edinburgh. A quick stop for refreshments, and a taste of some fine whiskey, we were back on the road heading through the Perthshire Forest heading south. All the while, learning more about the Jacobite’s, Mary Queen of Scots and the fascinating history of Scotland. One last quick stop in the pleasant small town of Pitlochry. got some great pictures of the main street. There are many little bakeries and ice cream shops to get a little something to hold you over until dinner. This was also a welcome spot to stretch your legs after the ride from Fort Augustus. Back in the van again, and headed home to Edinburgh. Along the way, we were able to catch a great sunset while passing over the Forth Bridge. We also got a quick history lesson about the Forth Bridge, its architectural significance and the rail bridge that shadows it. As we made our way back into Edinburgh we were treated to Dougie’s top spots for food, tours to take and museums to see, as well as some places to avoid. We also got a quick glimpse of the two schools that were the inspiration for Hogwarts in Harry Potter. Dougie pulled us into Waterloo Square just before 8 pm. A day well spent exploring the Highlands and Loch Ness. I would recommend it to anyone that is looking for a day-long adventure and enjoys learning about new places, their history, and natural beauty. Pleasure and thanks for your message. Hope to see you staying here at Casa Hamilton….